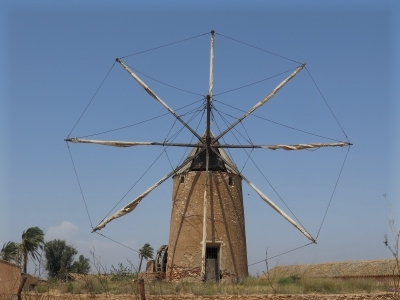 Mediterranean Wind Mills is part of the Tentative list of Spain in order to qualify for inclusion in the World Heritage List. Chasing these wind mills a la Don Quixote is not necessary. If you are anywhere near Murcia you can easily plot your drive past one them. With these flat lands it is also easy to spot them. They are not operational anymore but the one in the picture still looks in good condition. Another one just down the road is missing several blades. They appear to be on private land but you can go close enough to see everything. The documentation for inclusion is severely lacking any criteria and uniqueness. They have influence from the Dutch and Belgian windmills. Something to see on the way, not something to make a day trip out of and don't waste your money hiring a taxi for this.